Alessandro Di Liberto started studying the guitar at the age of eight, then switched to piano under the guidance of maestro S. Figliola, taking private lessons. In '85 he joined the Conservatory in Cagliari where he started studying classical composition with A.Guaragna. In the same period he formed his first live band and started performing in different venues in Cagliari. Having developed a passion for jazz, after attempting the entrance examination he was accepted as a student at the Koninklijk Conservatorium in The Hague, where he studied jazz piano for several years with Rob van Kreeveld. During his stay in Holland, together with German saxophonist Klaus Gesing, he founded the Di Liberto-Gesing quartet. With this quartet he toured around Holland and also took part in some international prestigious festivals as the North Sea Jazz Festival (The Hague), Beauforthuis (Holland), Villach (Austria), Jazz à Vienne (France). In '98 he recorded a CD in Austria, entitled "Harmonix" with the above mentioned quartet featuring Christian Weber on double bass and Ewald Zach on drums. In the same year he started a collaboration with the Dutch guitarist Wim Bronnenberg, which led to a second recording entitled "Stream". In the Summer of '99 he returned to Sardinia and started an intense activity as a teacher. Thanks to his work at the Conservatory of Cagliari, he set up a two week master class for jazz improvisation. In November '99 he recorded a CD in Milan, entirely in his name, entitled "Tonalità Naturali", which features some of his most effective original compositions. This CD released in 2002 gained the favour of jazz critics. The quartet features tenor saxophonist Emanuele Cisi, double bassist Sandro Fontoni and drummer Francesco Sotgiu. 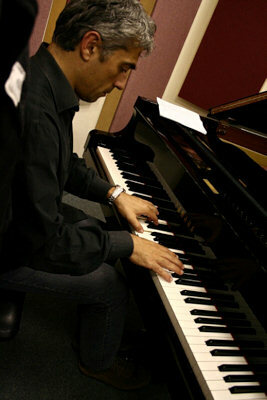 In 2001 he founded a private school in Cagliari giving music theory, jazz piano and jazz history lessons. In 2003 he was asked by Paolo Fresu to become one of the teachers of "Nuoro Winter Clinics" until 2012. Since 2005 he has been collaborating with Conservatory in Cagliari as Complementary Piano Teacher, also extending his output to Jazz Harmony, Combo and (since 2007) Main Jazz Piano. In 2006 he returned to Holland to record the album "Clima di un'estate", all his own original compositions, featuring Dutch trumpeter Eric Vloeimans, double bassist Hein v.d. Geyn and drummer Hans Van Oosterhout. Liner notes are written by Hein Van De Geyn. In the same year he formed "Improvvisarte", a cultural association with the aim of organizing jazz events. He was commissioned by the Lyric Theatre in Cagliari for a Summer tour in some of the most important venues in Sardinia, for which he set up a trio with drummer Daniele Russo and saxophonist Marco Argiolas. In 2010 he devoted himself to his latest trio CD entitled "Memorie di standards", released in November with the Italian label Philology. The CD features Daniele Russo on drums and Nicola Cossu on double bass, and gained positive reviews by Jazzit and Cadence Jazz Magazine. In 2011, together with Birmingham based double bassist Sebastiano Dessanay he recorded a CD called "Songbook vol.2" whose track list is made up of some of the best Dessanay's compositions. The album was produced by the British label F-ire. Special guest in this project is trumpeter Fulvio Sigurtà. In 2012 he recorded the CD "Songshine", a quintet featuring singer F. Corrias and saxophonist Stefano D'Anna. This album contains a couple of his own compositions plus some of his arrangements. The CD was released with Sardinian label S'Ard Music. In October 2014 he recorded in Cagliari another CD in his name, entitled "Four jazz Suites". This CD features Daniele Russo on drums and Nicola Cossu on double bass. Special guest of this project is saxophonist Rosario Giuliani. This album was released in 2015 by the American label "Art of Life" and is available as digital download on ITunes. Last but not least, in December 2014 he was appointed Chair of Jazz Piano at the Conservatory N. Piccinni in Bari, where he has been teaching Principal / Complementary Piano and Harmony within the Jazz Three-year and Two-year courses ever since. In the course of his career Alessandro Di Liberto has had the chance to collaborate with many important leading musicians of the national and international scene, such as trumpeters: Jon Faddis, F. Boltro, A. Gravish, Paolo Fresu, L. Aquino, G. Amato, F. Sigurtà, Eric Vloeimans, saxophonists: K. Gesing, E. Cisi, M. Carboni, R. Giuliani, M. Giammarco, S. Di Battista, R. Luppi, S. D'Anna, R. Regis, M. Negri, J. Lourau, M. Rosen, Michael Erian, singers: David Linx, Ana Flora, J. Yuille, K. Leo, Imaani, F. Claassen, F. Corrias, guitarists: W. Bronnenberg, B. Ferra, M. Ferra, P. Alfonsi, G. Corona, A. Lazzeri, drummers: H. v. Oosterhout, D. Russo, R. Gatto, D. Garcia, E. Zach, P. Frailis, A. Garau, E. Nijhoff, F. Sotgiu, G. Filindeu, vibraphonist: Joe Locke, bassists: H. v. de Geyn, S. Dessanay, J. Somsen, S. Fontoni, N. Cossu, P. Matino, G. Gudmundsson, P. Dalla Porta, C. Weber, N. Muresu, T. W. Andersen, Frans v.d. Hoeven and many others.